My brother and I are trying to eat healthier foods and be more active. Since he works full time and is heavily involved in his church, it's difficult for him to get to the gym some days. And I simply can't afford to go. 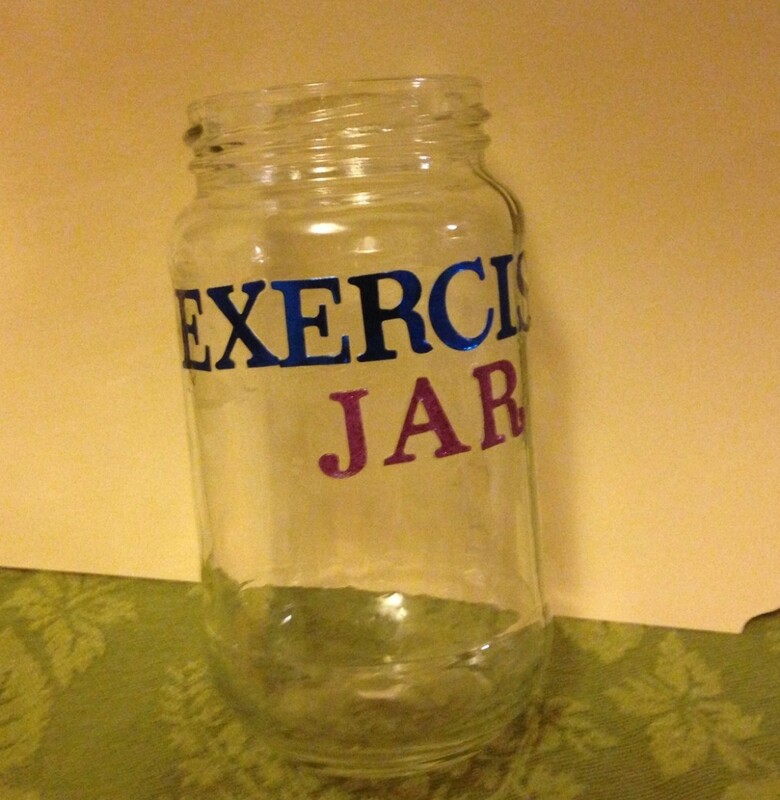 To make being active something to look forward to and more convenient, I made exercise jars. 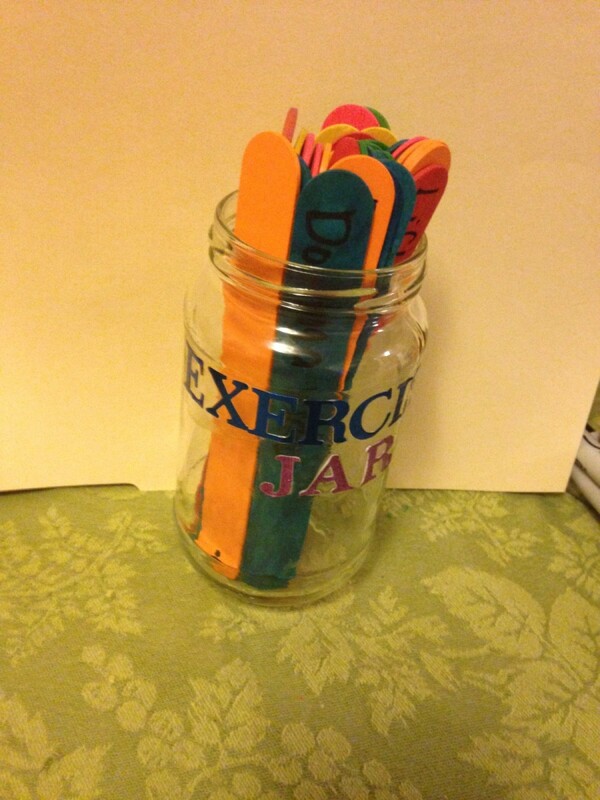 The great thing about these is that we can always add different exercise choices when we need something new! Tear the label off the pasta jar and remove any residue. Fingernail polish remover helps with this. Then you can take the rest off with soapy water. If you want to give your jar a name, use alphabet stickers and cover it with a layer of mod podge. Use the Sharpie to write an exercise on each side of the craft sticks. I made 30+ to cover an entire month. Draw a dot on the right or left tip of each stick. Place the sticks in the jar with all the dots facing up or down. Choose one stick per day and do the exercises listed on each side. Place the stick back into the jar with the dot facing the opposite way so you know you've done that one. What a novel idea and I commend you both for your efforts to stay healthy. 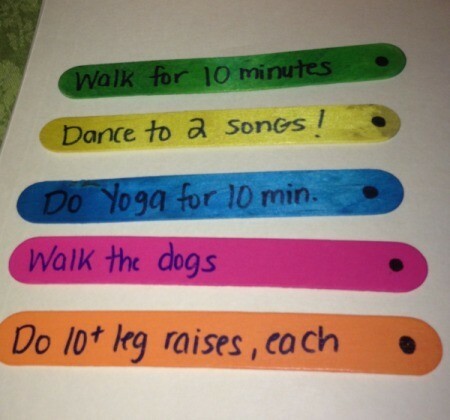 A little exercise every day goes a long way. Thanks for sharing. Thanks! It's about time that we start trying to live a healthier lifestyle. I want to be able to go out and do more than work. Hopefully, losing the LBS will help with that and fast! I think this is a great idea. Perhaps write the names of assorted Leslie Sansome Walk Dvd's, They range from 10 minutes up to an hour.